These Spice Cookies are delicious with their hard and crunchy texture. They have a wonderful spicy flavor, with just the right amount of heat, that comes from ground cinnamon, ginger, and cloves, and a little black pepper. Add to that their buttery almond flavor and you have the perfect snacking cookie. 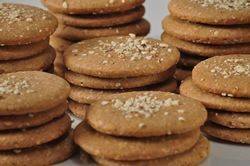 These Spice Cookies are very addictive and I find it almost impossible to eat just one. I found this cookie recipe while reading Maida Heatter's 'Brand-New Book of Great Cookies'. Maida Heatter has a whole series of baking books covering topics like Cakes, Cookies, Pies & Tarts, Chocolate and even a general Dessert cookbook. They are all terrific. I love how her instructions are so thorough. It's as if she is in the kitchen with you and instinctively knows and answers all the questions you may have. A few notes on ingredients. What makes this Spice Cookie unique is that corn syrup is added to the batter which makes the dough quite pliable, almost like a tootsie roll. This also makes rolling and cutting out the cookies quite easy. Corn syrup is a thick, sweet syrup that is available both clear (light) and brown (dark). For this recipe we are using dark corn syrup, which has a caramel color and flavor which gives the syrup a deeper flavor than light corn syrup. It is usually sold in glass or plastic bottles. However, if you can't find dark corn syrup you could use light corn syrup or even golden syrup. When you roll the dough it must be rolled quite thin as you want the baked cookies to have a snappy crunch and make sure not to over bake the cookies as they will become very hard. Spice Cookies: Place the corn syrup, sugar, and butter in a medium large saucepan. Place over medium heat and bring to a boil, stirring constantly. Let the mixture boil for about 2 minutes, then remove from heat and set aside to cool to lukewarm. Meanwhile preheat your oven to 350 degrees F (180 degrees C). Toast the almonds for about 6-8 minutes, or until the nuts are lightly browned and fragrant. Set aside to cool. In a large bowl whisk the flour with the baking soda, ground spices, salt and pepper, and lemon zest. Remove about 2 tablespoons of toasted almonds and chop them into small pieces. Set aside to use as garnish for the cookies. Place the remainder of the almonds in your food processor, fitted with a metal blade. Add about 1/4 cup of the flour mixture and process until finely ground. Add the finely ground nut mixture to the flour mixture and whisk to combine. When the corn syrup mixture is lukewarm, stir in the vanilla extract and almond extract. Add this mixture to the dry ingredients and stir to combine. Divide the dough in half and wrap each half in plastic wrap. Refrigerate for about an hour or until the dough is firm enough to roll out. Preheat your oven to 375 degrees F (190 degrees C) and line two baking sheets with parchment paper. On a lightly floured surface, roll the dough to a thickness of l/8 inch (3 mm). Use a 2 1/2 inch (6 cm) round cookie cutter to cut out the cookies. Transfer cookies to the baking sheet, spacing about 1 inch (2.5 cm) apart, and sprinkle with some chopped almonds. Bake for 7 to 10 minutes or until lightly colored and beginning to brown around the edges. Cool cookies on wire racks and then store in an airtight container.